We are $19,000 away from reaching our campaign goal to secure the long-term care of the newly created 85 acre Thomas C. Agnew Reserve near Washago. Major donations from family members, the Township of Severn and the Ontario Land Trust Alliance have all helped us toward our goal of $77,600. Now we need your help to push the campaign over the top. The Conservancy is planning to develop trails, fencing and signage on this property in 2013 to make the property accessible to the public at the same time as we curb abuses that threaten its natural features. A ceremony is planned to officially celebrate the acquisition in the fall. Set on the edge of the Trent-Severn Waterway, the property is adjacent to the Robert and Emily Fawcett Natural Area and the two properties contain the same precious wetland complex, teeming with wildlife. 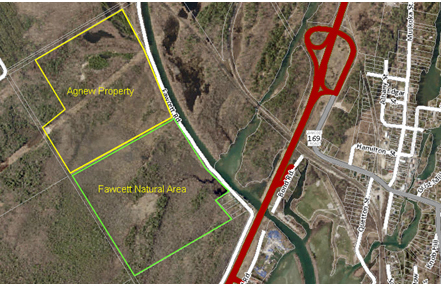 The new Agnew Reserve also contains a mixed upland forest which is a groundwater source for the larger wetland. More than 228 native plants have already been identified in the wetland/forest complex and there are undoubtedly more to be found. From rare inset-eating pitcher and sundew plants to pink moccasin orchids, the wetland is jeweled with fascinating flora. Wood warblers and vireos dart among the branches of mature trees while marsh birds such as the American bittern wade through cattails and sedges. Endangered turles make the reserve their home, including including Blanding’s and snappers. Please help us to push this campaign over the top by making a donation today. Cheques can be made out to The Couchiching Conservancy – Agnew Reserve, and mailed to Box 704, Orillia, Ontario, L3V 6K7. If you prefer, you can also pay by VISA by calling 705-326-1620 or by using our online donation service through Canada Helps. Charitable receipts are issued for all donations over $20. This entry was posted on March 25, 2013 at 11:18 am, filed under Properties and tagged Agnew Reserve, Orchids, Snapping Turtles, Thomas C. Agnew Nature Reserve, Thomas C. Agnew Reserve, washago. Bookmark the permalink.